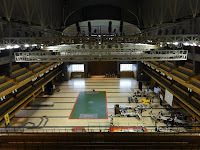 Full-scale robot soccer took place at HOBBY ROBOT COLOSSEO, the biggest hobby robot event in Japan which took place at Shizuoka Convention & Arts Center "GRANSHIP" in Shizuoka City on Sep. 3-4, 2011 during the 50th Japan SF Convention. More than 80 robots joined the COLOSSEO. All competitions in the COLOSSEO were shown on ‘Ustream HOBBY ROBOT COLOSSEO’ by Ishikawa-san and Tobby-san and videos were keeping in the channel. The most interested and excited competition was ROBO-SOCCER which took place as full-sacle robot soccer at 16:45 on Sep. 3rd and at 13:00 on Sep. 4th. Twenty-four robots joined on Sep. 3rd and 20 robots joined on Sep. 4th. Robots were divided into two teams, S-Pluse named after Shimizu S-Pluse and Jubilo named after Jubio Iwata, real soccer teams of Shizuoka prefecture. 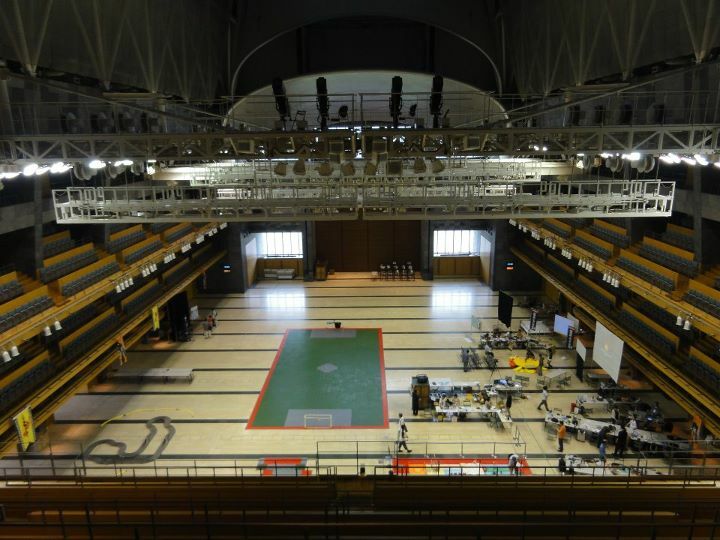 The soccer field was large enough to play full-scale robot soccer game. As the floor was made from smooth plate, the soccer ball rolled moderately on the floor. It seems to be hard for robot to walk on the carpet type floor and for soccer ball to roll on the floor. The first half was 10 minutes, halftime 1 min and the second half was 10 minutes. ROBO-SOCCER is sponsored by NPO Hamamatsu Monodukuri Koubo. 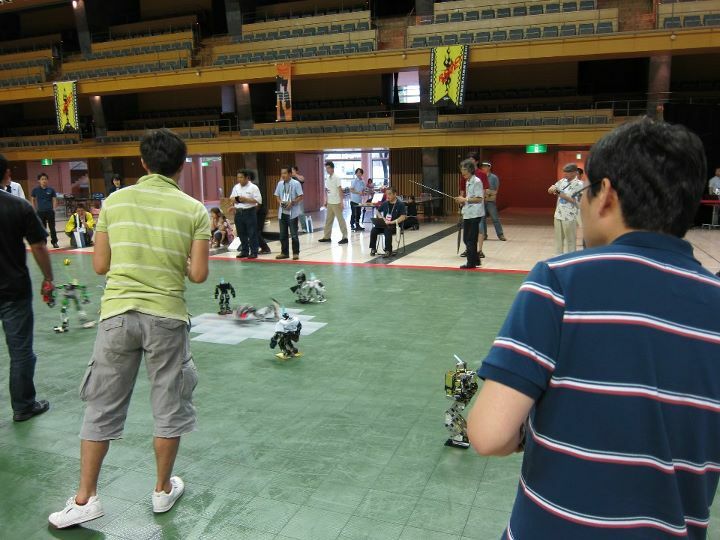 The 1st ROBO SOCCER took place on Dec. 5, 2009 and the 2nd one took place on July 24 in Shizuoka City. The robot body regulation and game rule are similar to those of KONDO CUP. Details of the Full Soccer Game were also described in Journal Mycom (in Japanese).